That will bring joy best around mealtime! For this gift that’s given in earnest. A vintage form of vittles comprised! To create a real Kodak moment. Now go ahead and snap a picture! 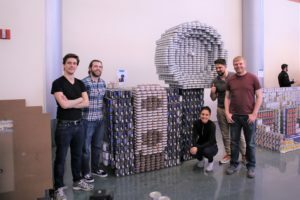 “CANdid Camera” required nearly 4,600 cans of black beans, chili with beans, chicken and tuna, all of which will go to help the Freestore FoodBank after the conclusion of the CANstruction event. Hixson’s display can be seen at the Weston Art Gallery through the end of April. Want to see how it was built? Check out the timelapse video on the Hixson YouTube channel!